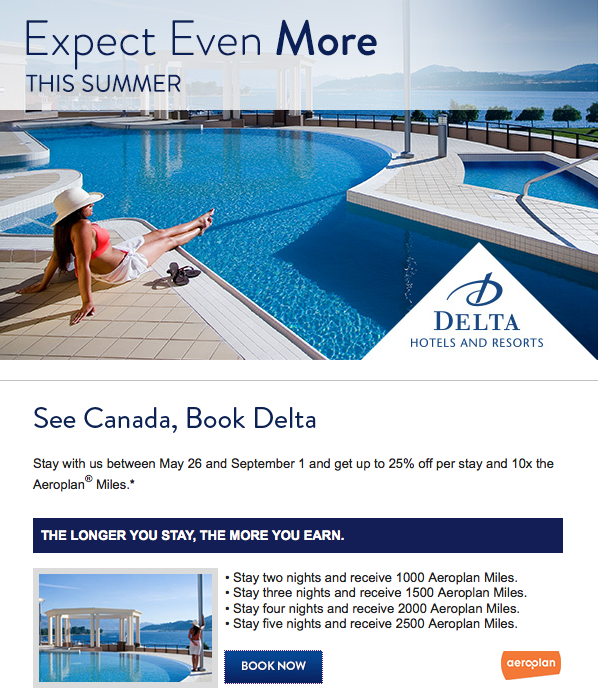 There are only 4 days left in the current Delta Aeroplan offer and now we have the details of their summer promotion. It is of no use to those of you doing one night stays but if your business takes you on multiple night stays or you are planning some summer vacation with Delta in mind then this offer is ripe for you to max out your Aeroplan mile earning on. Delta Privilege Platinum Plus+ members will still receive their Platinum bonus on top of this bonus. • Stay two nights and receive 1000 Aeroplan Miles. • Stay three nights and receive 1500 Aeroplan Miles. • Stay four nights and receive 2000 Aeroplan Miles. • Stay five nights and receive 2500 Aeroplan Miles. Can't make use of this offer? Be sure to check out Rewards Canada's Aeroplan Bonus Milespage for dozens of other bonus offers!